12 x 12, 50hp. Boiler & engine from FERO. 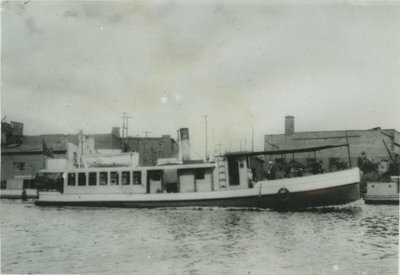 1883 Used as a ferry, Duluth - Superior with FREETRADE & MARY MARY MARTIN. 1883, Apr 21 Enrolled Duluth, MN. 1886, Oct 5 Owned Samuel Osborne, Duluth. 1886, Nov 24 Owned Frederick Langebeer, Duluth. 1886, Dec 3 Owned Dorothy Lloyd, Duluth. 1887, May 26 Owned Al Bischoff & John Hanson, Duluth. 1889, Mar 5 Interior rebuilt. 1890, Apr 14 New boiler & other improvements. 1890, Dec 3 Owned Dorothy Lloyd, Duluth. 1891, Feb 2 Owned George S. & John D. Lloyd, Duluth. 1891, Apr 14 Sunk at West Superior due to ice build up. 1892, Oct 19 Damaged in collision with dock at Duluth. 1894, Sep 11 Sunk at Connor's Point, Superior, after being holed by a snag. 1895, Apr 23 Owned A.C. Majo, Duluth. 1911, Sep 29 Burned at Superior.